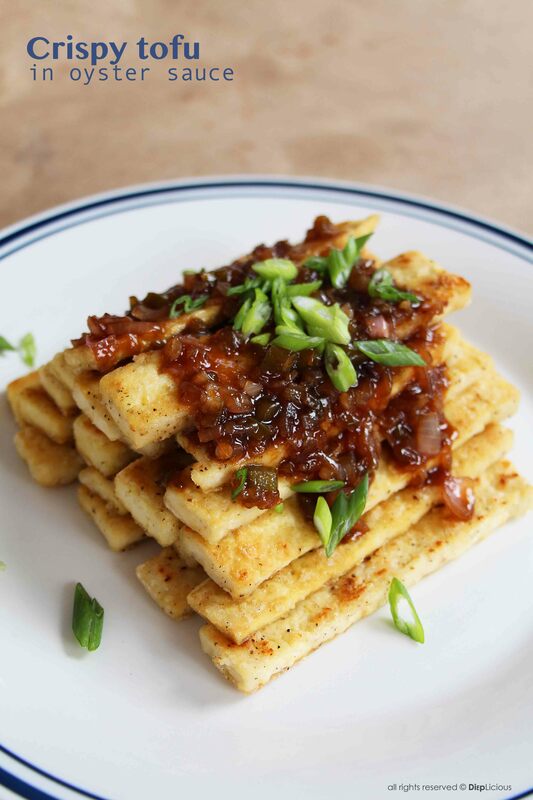 This is a simple but tasty tofu dish that works well alone as a snack, or as part of a Asian-themed meal. 2. Cut the tofu in half on the height side (about 3/8”x 5” x 3.5”) and then cut again lengthwise making 20 equal 5” length strips. 3. Mix the flour, cornstarch, salt and pepper in a bowl and turn the tofu pieces in the flour mix. 4. Heat 1 tablespoon of sesame oil in a pan over medium heat until hot. Add the tofu to the pan in one layer (it may take two rounds to fry the whole package). Fry one side until browned and crisp, and then turn to fry the other side. Remove the fried tofu onto a paper towel-lined plate to absorb excess oil. 5. Arrange neatly stacked on a serving plate. 1. Heat peanut oil in a small pan on medium heat, and then sauté the shallots until browned. 2. Turn the heat to low and add the oyster sauce, water and sugar. Mix to make an even sauce. 3. Let the sauce simmer for another minute to thicken and pour it over the fried tofu. Sprinkle with scallions. *To drain the tofu, place some paper towels on a plate, put the tofu on top, and cover with another layer of paper towels. Press the tofu by putting another plate on top and weighting down with something, such as a heavy book. Press for at least 15 min.